Mike Dyer (left), Serenity Lane’s president and CEO, and Larry Bradley, its vice president of development, tour the new facilities in Coburg. It’s got that new treatment center smell. It’s also drawing “ski lodge” comparisons, much like PeaceHealth’s Sacred Heart Medical Center at RiverBend in Springfield did when it opened in 2008 — albeit on a smaller scale. “This is amazing — look at that view,” says Larry Bradley, vice president of development for Serenity Lane Health Services, ­standing outside the nonprofit chemical dependency center’s new $28 million facility, scheduled to open in ­mid-March. Bradley is looking to the east, toward the Coburg Hills, on an unseasonably warm and sunny Friday. “Right now, at the old campus, our view is of student housing, with kids with beers over a fence,” Bradley adds. After years of effort and planning, Serenity Lane’s dream of moving out of the only home it has every known, a cramped two-story former fraternity house on East 16th Avenue, near the University of Oregon, to this tranquil piece of ­countryside property ­purchased for $2 million in 2008, is finally happening. “This is an environment that is conducive to recovery,” says Bradley, a recovering alcoholic himself who has been sober for 31 years, since receiving ­treatment at Serenity Lane in the mid-1980s. Serenity Lane already has treated about 65,000 people since opening in 1973. It’s also earned a reputation as not only one of the top treatment centers of its kind in the Northwest, but in the nation. In 1988, it was listed in a book called “The 100 Best Treatment Centers for ­Alcoholism and Drug Abuse.” That, of course, was a long time ago. But something keeps drawing those who seek help for debilitating drug and alcohol addictions. And most, Serenity Lane CEO Mike Dyer says, come from outside Lane County. Only about 1 in 4 patients that walk through the ­treatment center’s doors is from the Eugene-Springfield area, says Dyer, also a ­recovering alcoholic who got sober in 1984. Most come from elsewhere in Oregon and some from other states. At about $16,000 for a 28-day stay, it’s not inexpensive. But health insurance covers part or all of the cost for about 75 percent of patients, Dyer says. And it’s less than what high-end treatment centers charge. 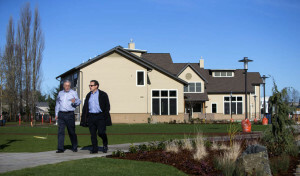 A monthlong stay at Springbrook in ­Newberg, run by the Hazelden Betty Ford Foundation, is about $30,000 a month, Dyer says. What this ­gleaming new campus, ­consisting of a dozen buildings and spread over 15 acres, gives Serenity Lane is the chance to immediately treat almost twice as many patients. There’s also space to build. Capacity at the current facility is about 65 patients. That includes room for 10 patients in detox (where the stay runs from a day to a week) and 16 patients in Serenity Lane’s highly regarded ExSL (Extended Stay) program (patients stay anywhere from a month to four months). ExSL opened in the late ’90s and is based on a California state prison program near San Diego. The new facility has four two-story residence halls. Each can hold 20 patients (10 rooms each that sleep two). The new detox unit can hold 20, and the ExSL building still will have 16 spots. That provides for a grand total of 116 patients. And if death and taxes are life’s two certainties, well, the need for treatment centers for those suffering from drug and alcohol addictions is not far behind. “This is a disease,” says Bradley, ­walking through the sunlit administration building. Yet, he and Dyer and others who work in the field still battle the ­perception that it’s not, that it’s some sort of moral weakness. One thing is for sure, though: Serenity Lane’s approach has had to change drastically since those first few alcoholics strolled through its doors in 1973, after Eugene’s Dr. Thomas Kerns founded the facility. “He just really wanted (alcoholism) to be accepted by society as a mainstream illness,” Neil McNaughton, ­Serenity Lane’s former executive director, told The ­Register-Guard in 2005, the year Kerns died at age 85 of renal failure. A father of eight whose five sons include Eugene Police Chief Pete Kerns and Lake Oswego pastor John Kerns (a Serenity Lane board member), Thomas Kerns moved to Eugene from Grants Pass in 1949 to practice at the Eugene Hospital and Clinic. “They’re obviously very proud of their father and his mission, and they’ve continued to tell us that he’d be proud,” Bradley says of Kerns’ children. It was a vision that initially included only alcoholics. In the late 1970s, though, an “intense debate” ensued among Serenity Lane’s board about treating those addicted to other drugs, Bradley says. Today, very few of Serenity Lane’s patients are “run-of-the-mill ­alcoholics,” Dyer says. Much more common, Bradley says, is what’s known as dual diagnosis or “co-occurring disorders.” They suffer not only from a substance abuse problem but also mental illness. That could be alcoholism and depression; or it could be a meth addiction and PTSD; or someone with a heroin addiction and an anxiety disorder. Add the fact that opiate addictions, especially those not only to heroin but prescription painkillers, are at an all-time high, and centers such as Serenity Lane have their work cut out for them like never before. Drug overdose deaths in 2014 reached a new high nationally, 47,055 (about 129 per day), according to a ­Tuesday story in The New York Times, based on numbers from the ­Centers for ­Disease Control and ­Prevention. Many of those deaths, the story said, came from prescription painkiller and heroin overdoses. To help deal with this new world of addiction, Serenity Lane recently hired a full-time psychiatrist to join four mental health professionals already on staff. But Serenity Lane plans to stay true to Kerns’ vision of a specialized treatment center founded on the abstinence-­based, 12-step model of recovery. “We want to remain really loyal to our founder’s principles,” Dyer says. That means a program focused not just on treating the addict, but the addict’s family. It also means plenty of group therapy, to take place in spacious new “group pods,” and getting patients focused on a new way of life. “This is my favorite area,” Bradley says, standing next to a large stone fireplace in the new family meeting area. “A lot of magic, a lot of miracles are going to happen here. It will form the foundation of what we do here,” he says of treating the whole family, the sound of nail guns echoing throughout the building. Eugene’s Chambers Construction is working to be ready for open houses to be held March 11-12, ahead of patients’ first day at the new facility on March 14. Bradley says the family meeting area will be called Gilbert Hall, after Serenity Lane alum and donor Jerry Gilbert, one of the treatment center’s first 100 patients . The new place is full of names to honor Serenity Lane’s past. The treatment center lost its beloved medical director, Dr. Ronald Schwerzler, 73, to cancer in November. The search is on for a new medical director, Dyer says. The hospital unit will be called the Dr. Ronald Schwerzler Hospital Unit . Outside is the Jim Creasey Jogging Trail, named after another legendary figure from the treatment center’s past. Creasey, also one of Serenity Lane’s ­original patients, went on to become a highly respected counselor for two decades. He died of cancer at age 68 in 2004. The connection to its past in an important one, Bradley and Dyer say. After all, the new facility wouldn’t have happened without donations of between $4.5 million and $5 million. Donations run from seven figures to employees giving $2 out of every paycheck. Alumni have purchased bricks and pavers with their names and tributes to loved ones who’ve died from addiction on them. They will be installed in a fountain and basalt column area next month. Last year, a local family gave $700,000 for a fitness center that will include a basketball court and workout room . Original fitness center plans had to be scrapped for lack of funding, but now it’s happening. Serenity Lane for years has had an agreement with the Eugene Family YMCA, just four blocks down Patterson Street. Staff walk patients to the Y daily, but now patients will have their own on-site workout spot. Plans for a Meditation Center also had to be put on hold, but fundraising continues for a building that’s expected to cost $700,000, Dyer says. Plans include a chapel and a chaplain’s office. “I don’t know anybody who doesn’t have a healthy recovery program where spirituality isn’t part of it,” Bradley says. Despite rumors, Serenity Lane doesn’t plan to raise its patient rates, Dyer says, but added revenue will come from having more patients. No more turning prospective patients away, Dyer says. With only 10 detox beds at the current facility, that’s been the case for years, he says. When a patient is ready, or a significant other or employer is ­putting the pressure on, the window to get someone into treatment often is quite small. “Sometimes, that window is only a couple of hours,” Dyer says. A shiny new facility with twice the space — and room to grow twice as large — should help. But stone fireplaces and a dining hall big enough to drive a truck through and what Bradley calls “nice, soft furniture” won’t substitute for a continuing vision and a commitment to provide the best care possible for a perplexing disease that kills more than 3 ­million annually worldwide from alcohol abuse alone, according to the World Health Organization.